A fire is a great help to all of those in the wilderness. When you’re lost and alone in the wilderness without knowing what your next move is or should be, make a fire. There’s a reason why making a fire is the first and foremost step you need to make, and why it’s man’s greatest invention and aid. This is essential for those that are in the wilderness during the winter, but it’s equally essential any time of the year. In some places, a need for warmth can still be present even in the summer, so with the help of a fire you’ll stay warm and remain motivated and positive. Animals are a natural part of the wild; it’s actually their home. But, you don’t want them invading your space. It creates fear, and it may even be dangerous, but luckily animals have an instinct that allows you to repel them. They’re afraid of fire as they regard it as dangerous. When animals see the campfire, their instinct tells them to move away from your area. Bugs hate smoke, and the campfire lets off a lot of smoke. This smoke will discourage many pesky insects from entering your area, and it will also drive away the ones that already inherited your site. This will work on mosquitoes, dragonflies and other buggy creatures. 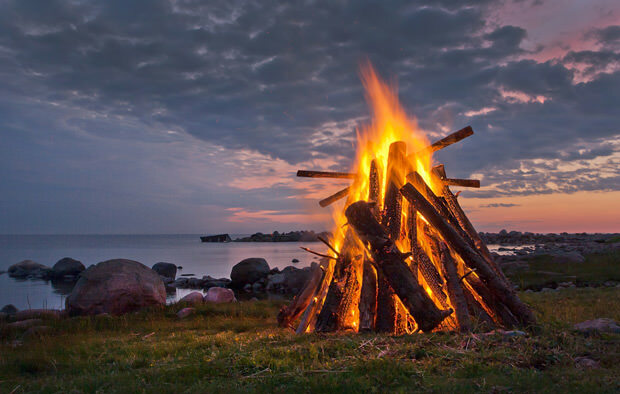 Making a campfire provides your with assurance that everything will be okay due to its warmth and light. It brings you a calm state of mind where you won’t worry too much over being stranded. Fire takes the place of a stove or microwave when you’re outdoors. That means you’ll need to cook all of your food around your one source of heat – fire. In order to purify water collected from a stream or any other water source found near the area you’re in, you need to bring that water to a boil for three to five minutes in order to get rid of all the bacteria and/or parasites that may be infesting it. Of course, again, only fire can provide that comfort. When you pick up a dead limb or log that has brush and small twigs attached to it, a fire can get rid of the unnecessary parts to the wood. Your big log is your main wood that will keep your fire going. The small twigs and brush burn rapidly away, so they’re unnecessary. However, you don’t want them cluttering your area of dwelling, so you can burn them as unnecessary materials. Harris A. Norman is a 30-year-old hiking guide, former fitness instructor and part-time blog writer at www.prosurvivalist.com. His favorite past times are fishing, painting and spending time with his dogs in his home town of Green Bay, Wisconsin.